K.P. LaMarco & Associates is owned and operated by Kevin P. LaMarco, a lifelong resident of the Connecticut River Valley who has been in the home improvement industry for over 15 years. He found his passion and inspiration from his family’s history and reputation in the building and construction trade. Kevin is the grandson of one of Connecticut’s most knowledgeable and respected building and remodeling contractors, William R. Hill, who owned and operated WRH Construction for over 40 successful years. Kevin took his lifelong education and talent in exterior remodeling and opened the doors to K.P. LaMarco & Associates LLC in 2009. Since then, we have delivered our services to over 300 satisfied Connecticut customers and counting. K.P. 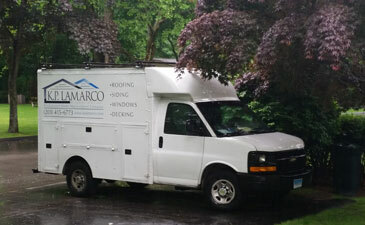 LaMarco & Associates is a fully licensed and insured home improvement company specializing in all your exterior needs. We strongly believe that a homeowner’s decision to contract a home improvement project needs to be an educated one. Our professionals are committed to making the entire process as smooth, easy, and comfortable as possible. Our office hours are 9:00 am – 5:00 pm Monday – Friday, with the exception of holidays. Appointments are made around the convenience of your schedule and will be promptly kept unless notified in advance. A homeowner must be available at the time of our inspection and measurement, which will take approximately 30 – 60 minutes. We do not leave, mail or fax estimates or proposals. We do not give “ballpark” estimates. We take great pride in putting together the correct proposed scope of work for you and your home. Every home is different. Once your project manager is finished with his inspection and measurements, he will return within a few days with a custom proposal specifying in detail your good/better/best materials and installation options. This particularly valuable time is needed to fully understand our scope of work for your project and to make sure you are fully comfortable with what we are proposing. Our crews are professionals who will treat your home with the utmost level of respect and courtesy. Proper work attire, language and a safe work environment will be maintained throughout the entire project. Our crews look forward to giving you the best installation you can get with a smile.